I’ve always known that knitting passes the time, but never thought it measures it. 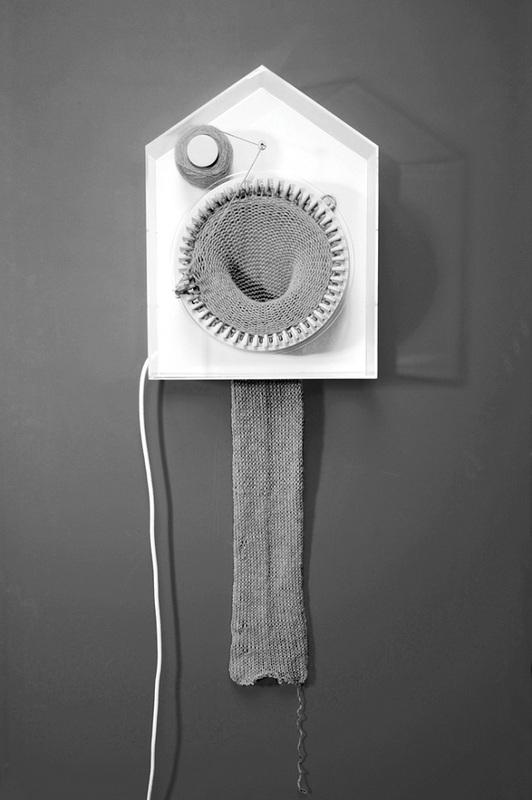 Norwegian designer Siren Elise Wilhelmsen designed “365”, a clock that knits a 2-meter long scarf in one year. Each stitch marks the passage of time, and the yarn still unknitted is the future, full of possibilities. Clock Knits A Scarf Over The Course Of A Year – PSFK. I want a knitting clock! I wonder if it could do lace or cables. Maybe I could set it to do a lace row on complicated exhausting days, a nice thick warm ribbing in the winter, or funky colorwork in time for the spring bloom. Or maybe just count the stitches in sweaters whose only function is to remind me of the time I spend with them. Hmmm I haven\’t seen the Wall in a long time but I prefer to think of the titbids left as a sort or anthropological Fimo gallery of bubbles well loved and shared.I believe San Loius is close enough to the ocean so the Salt of the Pacific indirectly sanitizes the gum for your protection You guys sure know how to have FUN! The ingenuity of man never ceaess to amaze me. This really is brilliant. So obvious, so clever, so cute, but until now, an idea hidden’ from the rest of us. Thats real genius. My husband buhgot two of these (one for himself and one for a friend) but then found out that the connecting cable does not thread through the holes in the wood!! HELP! Does anyone know what we are doing wrong? Or did we get two defective Jonas Damon IPhone docking clocks?